Nothing in all creation will ever separate you from My love. 35 Who shall separate us from the love of Christ? Could oppression, or anguish, or persecution, or famine, or nakedness, or peril, or sword? 36 Even as it is written, “For your sake we are killed all day long. We were accounted as sheep for the slaughter.” 37 No, in all these things, we are more than conquerors through him who loved us. 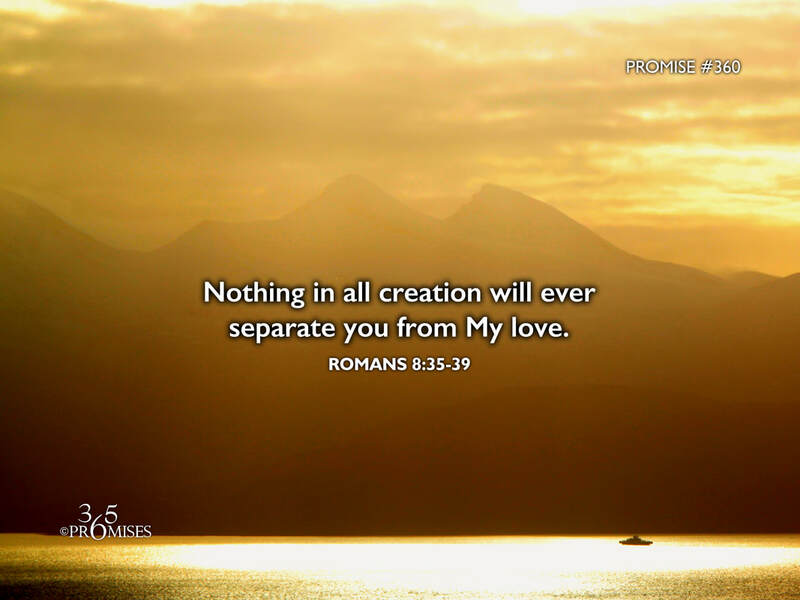 38 For I am persuaded, that neither death, nor life, nor angels, nor principalities, nor things present, nor things to come, nor powers, 39 nor height, nor depth, nor any other created thing, will be able to separate us from the love of God, which is in Christ Jesus our Lord. Paul the Apostle said he was convinced that nothing could separate him from the love of God. Then he went on to list many things that could try and separate him. Death, life, angels, principalities, powers, things in the present, things in the future, etc. But something happened in Paul's life that convinced him that no matter what happened, nothing would ever keep the love of God away. This is a man who was ship wrecked, stoned, persecuted at every turn and eventually martyred. If Paul needed to be convinced of the closeness of God's love, I think we do too. The Bible says that God's tender mercies are new every morning, so every morning is a new opportunity for each one of us to be persuaded that we are loved beyond measure. No matter what trials you are facing, nothing can ever separate you from God's love. Life can't separate you. Death can't. Angels or demons can't. Nothing in the present or in the future will ever separate you. No height, no depth nor any other creature will keep the love of God from overflowing and surrounding you... right now! My prayer is that we would be more convinced of our Father's love today than we were yesterday!